The Skoda Superb was first released in the UK in May 2002 and the last new one was sold in 2009. It was aimed at the executive market or at those looking for a luxury family car. The original range consisted of four engine choices, a 2-litre 115bhp, a 1.8 turbocharged 150bhp, a V6 2.8 litre petrol unit and a V6 TDi 2.5 litre diesel. Late in the summer of 2002, two petrol 1.9-litre engines were added to the range in either 130bhp or 100bhp guise. At the end of 2003, the V6 2.5 litre unit was revised, adding another 5bhp to its output and achieving Euro IV compliance. In late 2006, a series of small revisions took place which included a redesigned grille and the indicator lights were embedded in Superb's wing mirrors. A used Skoda Superb looks great from the inside with its wide cabin and tiny rear windows. There is a very nice dark timber wooden trim and plenty of leg room. The leather-coated multi-function steering wheel is adjustable for both reach and rake. The Skoda Superb was offered with three trim levels, Elegance, Comfort and Classic, all of which include a trip computer, air conditioning and electric windows. The top-of-the-range Elegance adds climate-controlled air conditioning, rain-sensing wipers, 17-inch alloy wheels, electric seats (with memory system), a CD stereo system and xenon headlamps. The Skoda Superb's driving experience is not particularly involving, but the ride is excellent thanks mainly to Skoda's tweaking of the torsion beam suspension and four-link strut. ESP Electronic Stability Control is included on all models making handling a doddle. 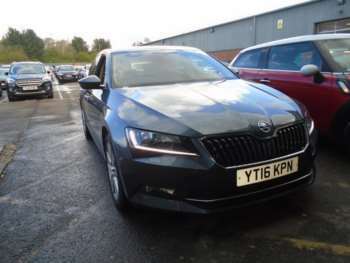 A second-hand Skoda Superb isn’t likely to get pulses racing, but it is a solid, stylish executive or family car that hardly ever goes wrong. Got a specific Skoda Superb model in mind?